A job well done as Dave thanks Joe Weatherby, CRB, for being on schedule and within budget. Tug Penobscot was neglected and abandoned at Port Canaveral after Hurricane Matthew. After the storm, the port authority secured the tug and attempted to locate the owner. All documents and records had been removed from the tug. 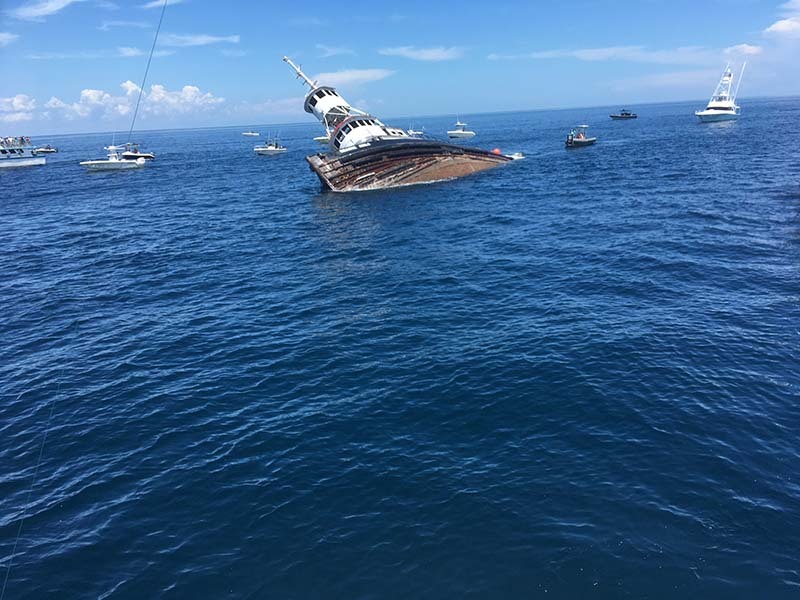 Concerned about the vessel and the environment, the U.S. Coast Guard started the slow process to remove fuel from the tug. The Port Canaveral harbormaster organized an auction hoping someone would claim the tug. 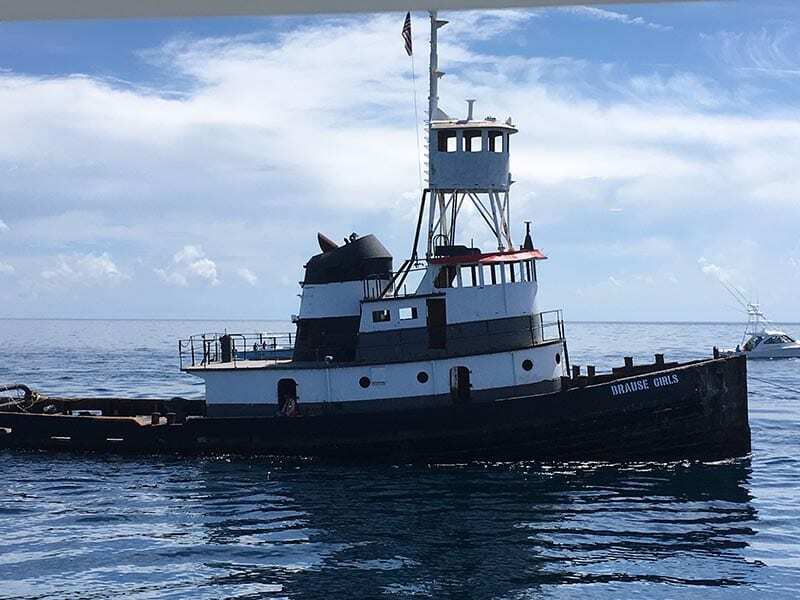 After several failed efforts to dispose of the tug, a gentleman came forward and took ownership and transferred it to a charitable organization, Sea-Life Habitat Improvement Project, Inc. (aka SHIP) of St. Lucie County. SHIP was founded to establish artificial reefs offshore in St. Lucie County. Working with CRB, a vessel clean-up company, SHIP raised enough money to arrange towage from Port Canaveral to the Fort Pierce Harbor commercial docks. 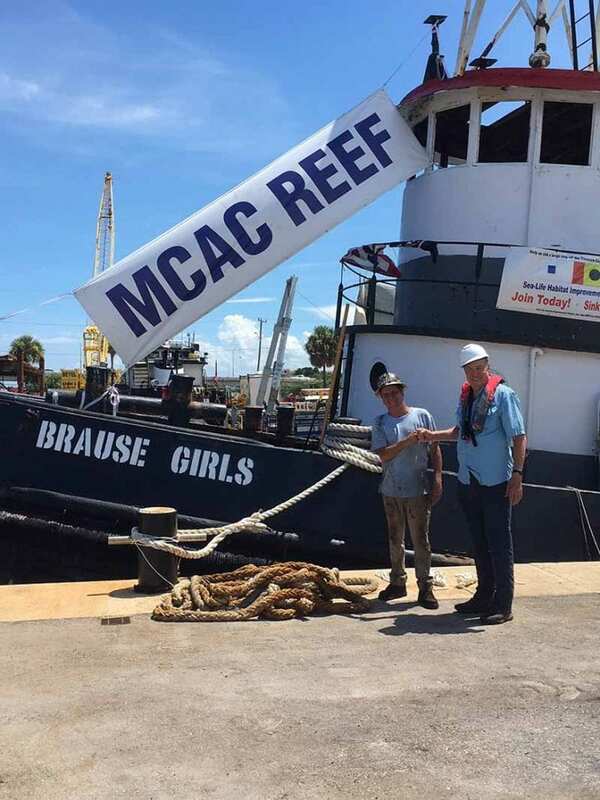 Unable to raise $100,000 to fund the entire project, in late July SHIP transferred ownership to the MCAC Artificial Reef Fund, which establishes artificial reefs in Martin County. The Port of Fort Pierce and St. Lucie County supported the project by donating three months of dockage fees to MCAC, setting a departure deadline of August 24. MCAC Reef Fund Vice-President, Dave Powell, would normally have had a team to tackle this project; however, with the deaths of MCAC Artificial Reef Fund member and diver, Kerry Dillon, Fund member Karl Wickstrom, and Fund president, John Burke fishing in Alaska, he had only one month to complete the project. The last week in July was used to negotiate and purchase the tug from SHIP for $10 and to negotiate a contract with CRB for the cleanup, inspections, towage and sinking offshore Martin County. The site selected in cooperation with the county and the state is in 185 feet of water at the south end of a line of existing artificial reefs. At the north end of this line, rests the coastal freighter “Wickstrom Reef”. Just north of the new sinking site sits the 200-foot bulk carrier “Haley Glasrud”. During the four-week project, MCAC needed to raise additional funds to cover the $100,000 total project cost after the Reef Fund’s large donation. The first sponsor/partner was Ted and Lynne Glasrud, who were given the naming rights. To recognize their three granddaughters, Jessica, Madison and Allison Brause, the new reef gained the name, BRAUSE GIRLS. Additionally, more than twenty-five sponsors committed to support the project including a SHIP sponsor, CCA (Coastal Conservation Assoc.) and Carlson Enterprises of the Treasure Coast. Initially, there were concerns the entire process could not be completed in 24 days. CRB’s clean-up process began on August 1 under Joe Weatherby’s supervision with the assistance of lead men, Chip Powell and Doug Lowell. Seven to 15 men worked 12-hour days, 7-days a week to meet the 24-day deadline. Numerous contracted companies supported the project. They included McCulley Marine Services for towage; the port of Fort Pierce for cranes; CBI for pump-out service and the Safari I, which provided a spectator boat for the deployment. Dive News Network provided video and drone coverage. During the cleanup, Bill Horn, on behalf of MCAC, undertook the permitting process with Martin County, Florida Fish and Wildlife Conservation Commission, State of Florida and the U.S. Coast Guard. Weatherby organized inspections by these same agencies. CRB employees were so supportive they painted the external surfaces to make the tug look good. On August 23, McCulley Marine Services personnel arrived and organized the towage of the “new” 62-year old tug. At 4 a.m. on August 24, the Brause Girls began its 25-mile voyage to the sinking site. More than 30 boats watched the mid-day sinking aboard sponsor boats Safari I and Wet and Wild, along with special guests and NBC reporters. Due to the low free board on the tug, holes were cut in the deck so once the deck was flooded from the open sea chest flooding inside the tug, the vessel submerged in a matter of minutes. The sinking was successful with the tug landing in an upright position. Within an hour, divers from Stuart Scuba descended and videoed the new reef and removed the go-pro cameras. They reported schools of amberjack and algae eating fish had already moved onto the vessel. To view video of the ship’s sinking, visit http://bit.ly/2QyPIqc. To learn more about MCAC Reef Fund, visit www.mcacreefs.org. The 100-foot Brause Girls tug on her way to becoming a Martin County artificial reef.